The topic of this page, the macaroni character, is one of many characters established in the 18th century. He received great attention in public debate, most of all in theatre plays and caricatures. In order to understand why this was the case one has to place the macaroni in the context of 18th century society. Therefore I will give a short overview of the changes that took place in many areas of everyday life and thus had a great impact on society. After explaining the concept of gender in the 18th century I will first introduce the character of the fop, before giving a detailed description of the macaroni and his features in order to answer the question why he played this prominent role in public life. The reasons for this are complex and have their sources in various fields of society. The 18th century was a century of great changes. These changes took place in geographical, political, economical and social terms. First of all, England and Scotland were united and so Great Britain came into existence. The political system changed from absolute monarchy to parliamentary system and political parties were established. Britain´s economy changed from an agrarian to a mainly commercial one as trade gained importance.1 All these transformations of course had a great impact on society. The famous `Rise of the Middle Class´ came to be the most fundamental change of the century. The middle class became the most important social class in Britain. Because of the fact that their number increased rapidly, they gained more and more influence on the formation and progress of the country and eventually formed Britain in a way to meet their needs. This became apparent in economic life, culture and society in general. The relatively new professions of shopkeepers and traders came into being. People were moving into the cities, first of all to the capital London.2 Life in the city was different to life in the countryside in the way that people had more leisure time and more money to spend on luxury goods, meaning things not necessary for survival but acquired for pleasure. Previously, clothes and other things were purchased for their utility, whereas now people were able to afford purchase for gratification. Thus a new sort of consumer society arose of which the middle class was the largest part.3 The members of the middle class set determined the parameters for the development of theatre plays, newspapers and books, using their financial power to have goods and literature produced the production according to their taste. This change is noticeable in particular regarding literature: the genre of the novel was established during this period. The novel was designed to be read in the private sphere, instead of the theatre, a public medium of expression. The novel was the ideal medium for the solitary education of women who were supposed to stay at home. Most novels gave accounts of individual fictional biographies in which sinful behaviour was punished and virtue always rewarded.4 Together with the (fictional) accounts of daily life in the newspapers, the novel thus helped to set the moral standards of the time in which deviant behaviour was perceived suspiciously as the example of the macaroni will demonstrate. For people who crossed the borders of what was seen as normal behaviour in some form, certain characters8 were invented. There was the rake, a particular masculine character who was unruly, royalist and virile in an exaggerated way. Women clichés were for instance the Coquette, the Prude or the Country Maid. In the following analysis the characters of the fop and the macaroni will be addressed in detail. 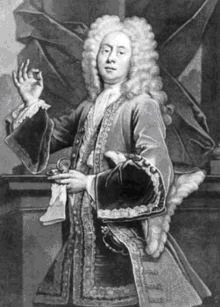 The most famous foppish character of the time was Colly Cibber, an actor and playwright. He performed the role of Sir Novelty Fashion, first in his play Love´s Last Shift and later in the sequel The Relapse by John Vanbrugh, were the character was called Lord Foppington. The characteristics of the macaroni character as well as the derivation of the term will be described below. Also the issue of contemporary sources will be addressed and the difficulties they pose in regard to reconstructing a realistic picture of the macaroni. Finally the social politics of the macaroni and the various anxieties he evoked in 18th century society will be analysed. It is not absolutely clear where and when the term `macaroni´ was coined. McNeil states that there has been a genre in poetry called macaronic poetry which indicated a type of Italian poetry that mixed the vernacular with Latin and was supposed to show off the education and wit of the composer. This mixing of languages out of superficial and not out of compulsory reasons fits the image people had of men who took great interest in their outer appearance.15 This quality of creating an artificial character, like writing a poem in an artificial language can be seen to be quite shallow and even meaningless. The term is mentioned in the correspondence of Horace Walpole, a famous writer and politician of that time. He is the first to describe this new phenomenon of fashionable men in greater detail in 1764. Nonetheless, already as early as 1757 there was a foppish character in a play by David Garrick named “The Male Coquette”, which was called Marchese di Macaroni.16 But wherever the term derived from, it is certain that the character of the macaroni was a phenomenon of the second half of the 18th century which occupied a prominent place in public debate, the reasons for this are as follows. 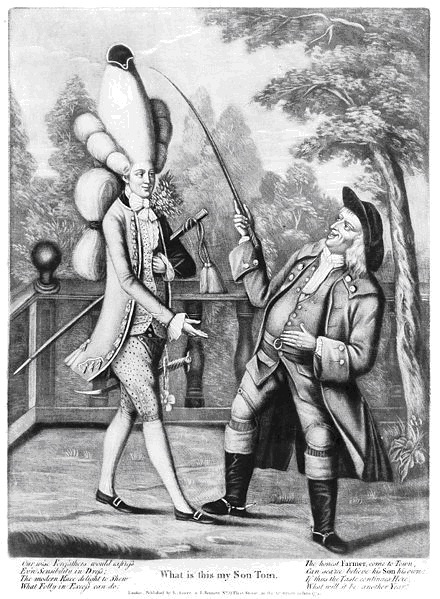 This caricature from 1774 is a very good example for various anxieties the character of the macaroni evoked in 18th century society.20 The contrast between the Briton and the so-called `other´ is shown in the picture of father and son. The father represents the concept of how a `real´ Briton should dress and behave whereas the son shows all the signs of a corrupted youth under bad influence. Tom, the son, is portrayed as a typical macaroni. His enormous wig and fashionable clothes underline the continental influence. The caricature stresses the fact that Tom is absolutely out of place in contrast to his father who wears the right clothing for the countryside. The white stockings, small shoes and colourful trousers and coat are totally unsuitable and impractical for his surroundings and therefore underline his superficiality and non-conformity. In contrast to his father, who is standing with both feet firmly on the ground, Tom appears to be nearly dancing which points to the fact that macaronis are everything but down-to-earth characters. 1. First of all, he crossed the borders of status, which had till then been strictly defined. Pompous and extravagant clothing had been reserved for the highest members in society, mainly for members of the court. In the beginning macaronis had been members of this social class but soon people of the middle and servant classes began to imitate this sartorial behaviour and soon it was difficult to differentiate between a wealthy and a poor macaroni.25 Thus they began to undercut the formerly hierarchical dress system where everyone could easily be identified in regard to his status in society. 2. Secondly, macaronis crossed the borders between the genders which were established at the time and where masculinity and femininity were defined by their total difference to one another. Because of his interest in fashion the macaroni was perceived as unmanly, nearly feminine. 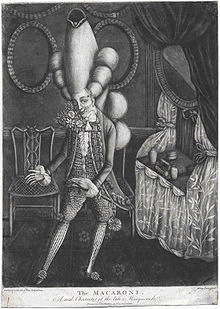 Because it was difficult for society to classify him, he was often identified as a sort of gender-hybrid.26 Nonetheless, the macaroni must not be taken for a cross-dresser, because although his interest in fashion was seen as a feminine trait, his clothes where always exaggerated versions of masculine ones. Last but not least, as mentioned above, the macaroni posed a threat to British identity. They did not fit into the general notion of how a British man should be and behave. The “classic Briton” had to be Protestant, understated and polite. This identification is set against the common image British society had of the French and Italians. French and Italians were perceived as Catholic, pompous and outgoing. So the macaroni with his continental behaviour represented the so-called “other”: the reaction to that was to ridicule him. 1 Paul Goring, Eighteenth-Century Literature and Culture (London: Continuum, 2008) 5-9. 2 Hannah Barker and Elaine Chalus, eds., Women´s History: Britain 1700-1850 (London: Routledge, 2005) 1-2. 3 Neil McKendrick, John Brewer and J.H. Plumb, The Birth of a Consumer Society: The Commercialization of Eighteenth-Century England (London: Europa, 1982) 1. 4 For the history of the novel cf. e.g. : Deirdre Shauna Lynch, “The Novel: Novels in the World of Moving Goods”, A Concise Companion to the Restoration and Eighteenth Century, ed. Cynthia Wall (Malden, MA: Blackwell Publ., 2005) 121-143. 5 Elaine McGirr, Eighteenth-Century Characters: A Guide to the Literature of the Age (New York: Palgrave Macmillan, 2007) 12-15. 6 Amanda Vickery, “His and Hers: Gender, Consumption and Household Accounting in Eighteenth-Century England”, The Art of Survival: Gender and History in Europe, 1450-2000, ed. Ruth Harris and Lyndal Roper (New York: Oxford UP, 2006) 13. 8 McGirr offers following definition of the term character: At the beginning of the 18th century it signified the external attributes of a thing or person whereas later on it stood for the assessment of the moral qualities of certain people (McGirr 1). 12 George E. Haggerty, Men in Love: Masculinity and Sexuality in the Eighteenth Century (New York: Columbia UP, 1999) 45. 17 Farid Chenoune, A history of men´s fashion, (Paris: Flammarion, 1993) 10. Barker, Hannah and Elaine Chalus, eds., Women´s History: Britain 1700-1850. Chenoune, Farid. A history of men´s fashion. Paris: Flammarion, 1993. Haggerty, George E.. Men in Love: Masculinity and Sexuality in the Eighteenth Century. New York: Columbia UP, 1999. Goring, Paul. Eighteenth-Century Literature and Culture. London: Continuum, 2008. McGirr, Elaine M. Eighteenth-Century Characters: A Guide to the Literature of the Age. New York: Palgrave Macmillan, 2007. McKendrick, Neil, John Brewer, J.H. Plumb. The Birth of a Consumer Society: The Commercialization of Eighteenth-Century England. London: Europa, 1982. McNeil, Peter. “Macaroni Masculinities”. Fashion Theory 4.4 (2000): 373-404. McNeil, Peter. ““That Doubtful Gender”: Macaroni Dress and Male Sexualities”, Fashion Theory 3.4 (1999): 411-448. Vickery, Amanda. “His and Hers: Gender, Consumption and Household Accounting in Eighteenth-Century England”. The Art of Survival: Gender and History in Europe, 1450-2000. Ed. Ruth Harris and Lyndal Roper. New York: Oxford UP, 2006. 12-38. Lynch, Deirdre Shauna. “The Novel: Novels in the World of Moving Goods”. A Concise Companion to the Restoration and Eighteenth Century. Ed. Cynthia Wall. Malden, MA: Blackwell Publ., 2005. 121-143. Wikipedia. 13. August 2010 .